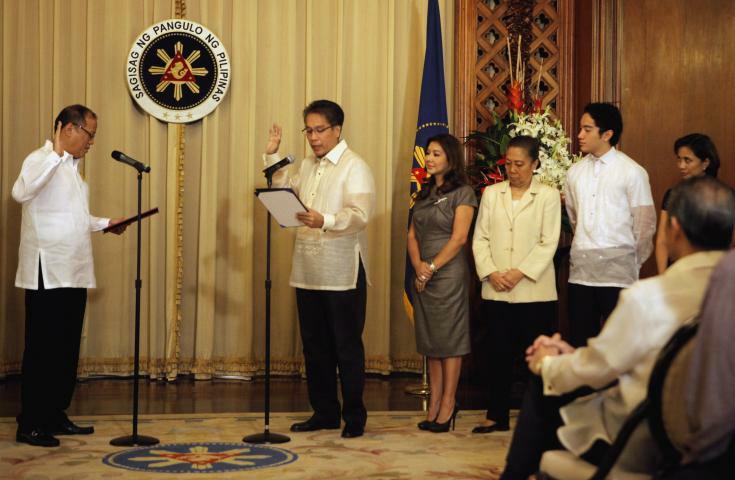 Mar Roxas II on Saturday takes his oath as the new secretary of Department of Interior and Local Government (DILG). President Benigno Aquino III lead the ceremony at Malacanang Palace reception hall 11:30 am. Roxas replaced the late Jesse Robredo who had died at plane crash incident. Present at the oathtaking are broadcaster Korina Sanchez, wife of Roxas and Jesse Robredo's widow Leonor. According to reports, Cavite Rep. Joseph Emilio Abaya, a former Navy officer who is finishing his last term as congressman will replace Roxas at the Department of Transportation and Communications (DOTC) position. Aquino appointed Roxas as the DILG secretary last August 31, 2012. Roxas graduated from the Wharton School of Economics of the University of Pennsylvania in 1979. In 2004, he was elected as a senator with nearly twenty (20) million votes, the highest for any senator in Philippine history. In 2007, he was appointed by officials of the Liberal Party national executive council as party president.